I did not know Frances McDormand until I saw the film Fargo a few months ago. I though she was wonderful in Fargo but after I have watched Olive Kitteridge, I think she's amazing. 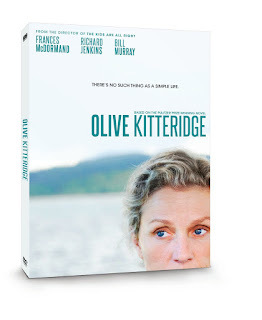 Olive Kitteridge was made into an HBO's 4-pert mini series in 2014 basing on a Pulitzer Prize winner novel of the same name by Elizabeth Strout. The novel itself consists of 13 short stories of Olive Kitteridge over the span of 25 years. The TV 4-parter does not contain all the 13 stories but picks up the main parts to tell Olive's story. Olive's character is quite complex and Frances McDormand has done a good job playing Olive, as a strict no-nonsense Math teacher, wife and mother. Olive's husband, Henry, was played by Richard Jenkins. I recognise him from Six Feet Under. Bill Murray had a part two in the last 2 episodes (they have to find very good and pretty strong actors to be opposite McDormand, and these two are not at all disappointing) . The story took place in a small seaside town in Maine. It's about people, normal and strange, their families, their interaction & interaction, Olive's up-tightness and sharp tongue ruffle too many feathers but her well meaning and good heart also touch many lives along the way. The series conclude where and how it should. Strongly recommended!